Larry Osborne has written several books that have been insightful, encouraging and challenging. You can find a link to Sticky Church here and Sticky Team here. 10 Dumb Things Smart Christians Believe is another book I’d recommend you reading but in the meantime here’s a quick summary from Leaders Book Summaries, a website that offers summaries of, for the most part, leadership books (for only $5.95/month). 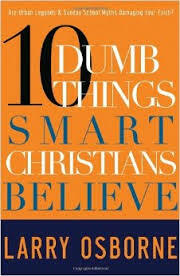 Click here for a summary of Osborne’s book 10 Dumb Things Smart Christians Believe. ← How would you define forgiveness?